This shorebug has traditionally been confined to the coast between Hampshire and Devon where it occurs on flush sites on soft sandy / clay cliffs. However, there are recent inland records of S. arenicola in SE England north to Huntingdonshire where it is associated with sand and gravel pits and where it may be locally frequent. The colonisation of these inland areas and habitats appears to be a fairly recent phenomenon and it it possible that there may be coastal and inland forms of the species. S. arenicola flies readily on hot days and can be extremely difficult to catch. Adults probably overwinter and breed between April and June, giving rise to a new generation of adults by July. Whether or not there is another generation before the onset of winter is unknown. The map is based on records from NBN Gateway, with yellow dots showing pre 1990 records, reds dots 1990 – 2015 records and red on yellow dots overlapping records. 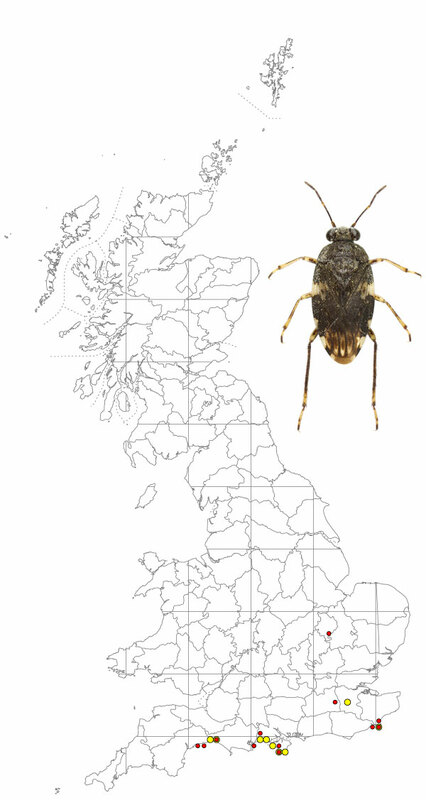 S. arenicola is a Nationally Rare species although there are probably more inland records than those shown on the map. It is absent from Ireland. Identification of S. arenicola is easier than for some of the other species of Saldula due to the characteristic broad white band across the base of the corium. There is also usually a pale spot near the apex of the clavus and white and black markings along the margin of the corium behind the broad white band.